Product #16180 | SKU RMBR300 | 0.0 (no ratings yet) Thanks for your rating! The Sony RM-BR300 is an advanced remote control unit for the BRC-300, EVI-D100, EVI-D70 and EVI-D30 cameras all while using the VISCA control system. 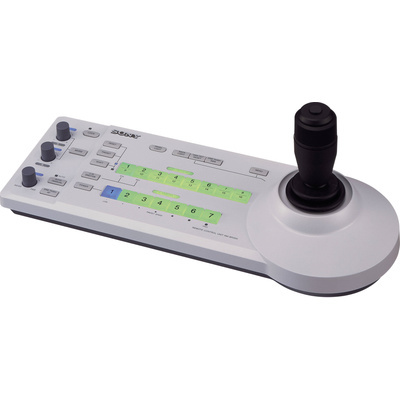 A joystick controller gives precision camera moves and focus adjustments. For the BRC-300, up to 6 preset camera and lens positions can be programmed for immediate recall. The other camera models have up to 16 preset positions. Controller operations include adjustments for auto-focus, white balance, the auto-exposure feature and backlight compensation. A tally lamp feature is also possible in these systems. The remote control features are performed using the standard VISCA protocol. An 8-pin to 8-pin DIN RS-232C cable required for the control functions is included. This controller can perform these functions with up to seven cameras in a daisy-chain configuration.